The Vermont Miata Club is one of many Miata clubs around the country and around the world. We are a diverse group of individuals that have been drawn together by the joy of owning and driving a great little roadster and sharing good times with like minded individuals. We have people of many interests, from techies who like to tinker with their cars to those who enjoy nothing more than a Sunday drive on our beautiful Vermont roads. We are an easy group to get to know, and we warmly welcome new members. 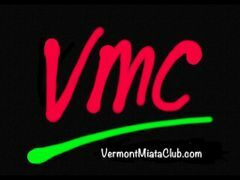 Membership in the Vermont Miata Club is $25.00 per car per year. The membership fee pays for insurance, our website, swag, a club windshield sticker and club cards. Please visit the Join Us page to sign up.